My grandmother used to make these during the holiday when I was young, and I started making them when someone gave me a bunch of coco powder. What seemed like a good way to use up a bunch of coco powder has turned into a quick and easy desert. Finished cookies cooling on a half-pan in the refrigerator. Not that the two cups of sugar makes this healthy in any way, but I have tried to make these a better treat for our boys by using good ingredients and bumping up the oats a little. We use organic raw sugar, Maple View milk, all natural peanut butter, and most recently I have taken to adding dried fruit to the mix. Mix together all the stuff in part A in a sauce pot and boil for two minutes. After two minutes remove from heat and mix in the stuff in part B until smooth. Stir in the oats in part C and mix (quickly) until it is consistent. 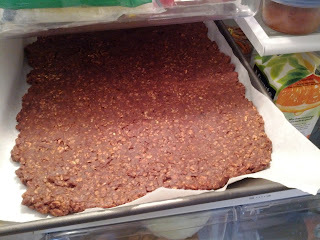 Pour the mixture out onto parchment paper and flatten to about a 3/8 of an inch. Allow to cool until firm. I was making these yesterday and found I was short on oatmeal. After rummaging through the cabinets for a few I found some KIND Healthy Grains and decided to give it a shot, and they turned out great. I have added chocolate chips, a couple times, but it got me to thinking about the limitless possibilities of things that could be added to this...Leave a comment if you come up with some killer addition.